So far as I know, 1980's Queen of the Demonweb Pits is artist David C. Sutherland III's only published example of game/adventure design. It's also (again, so far as I know) the first official example of planar adventuring for Dungeons & Dragons. Both these facts are important when looking back on this module and its impact. Dave Sutherland is known primarily for his illustrations, particularly during late OD&D and early AD&D. His artwork laid the foundation for many of the artists who followed by establishing the look of iconic monsters, such as demons, orcs, and mind flayers. As any reader of this blog knows by now, I am huge fan of Sutherland and, while I readily concede the technical flaws in a lot of his pieces, I also see a lot of joyful exuberance in them that contrasts powerfully with the more sterile perfection of later D&D art. But apparently Sutherland had ambitions outside of illustration. He certainly wasn't the first artist hoping to try his hand at writing and, unlike many, Gary Gygax gave Sutherland a chance. (It's worth noting that Dave Trampier also wished to break into game design, writing a game of monster battles called Titan, eventually published by Avalon Hill after TSR expressed no interest in it) According to the preface to this module, Gygax had trouble coming up with a proper capstone to the Giants-Drow series of modules. All his ideas were too similar to ones he was considering for the Temple of Elemental Evil, so he rejected them. After Dave Sutherland showed him a twisting, intertwined dungeon he'd created based on the design of a placemat, Gygax suggested he write the module, using the dungeon as the home plane of Lolth, demon queen of spiders. The end result was a very uneven module, equal parts gold and dross. The central premise of the module -- confronting Lolth on her home plane -- remains a powerful and attractive one. Likewise, the design of the Demonweb itself is extraordinarily clever. It is certainly one of the more unusual dungeon designs I encountered back in the day and, even now, I think it holds up pretty well. This is a good case for allowing individuals with artistic sensibilities to draw maps in my opinion, because the Demonweb seems like an idea that only an artist would conceive. The module's encounters are quite a diverse lot, which I think is a good thing, overall. Oddly, very few of them seem to include either demons or drow, which you would expect to find on the Abyssal plane that's home to the demonic ruler of the dark elves. Instead, you get lots of chaotic and evil creatures -- dragons, trolls, lycanthropes, undead -- that don't quite "fit" with the assumed theme of the place. I remember as a kid finding the inhabitants of the Demonweb to be not quite what I was expecting, so I replaced many of them with demons and horrid spider-things and similar nasty stuff. Somehow, I didn't find a black dragon to be appropriately "Lolth-y," if you know what I mean. Of course, there's something to be said for defying expectations. I've always been a fan of "pulling back the curtain" to show that the world as seen through the eyes of adventurers isn't the whole story. So, for example, Lolth's having a giant, steam-powered, mechanical spider ship never bothered me the way it bothered many people. To me, it's exactly the kind of bizarre turn that seems right when dealing with otherplanar beings, even demons (perhaps especially demons). There shouldn't be anything ordinary or predictable about their natures or behaviors. Similarly, I really liked the inclusion of gateways to other Prime Material Planes, including one cribbed from Poul Anderson's Three Hearts and Three Lions. A key to portraying planar travel effectively is grandeur -- the sense that one's home world is just a tiny speck floating on a giant ocean and you've only just begun to plumb its unknown depths. Module Q1 actually does a decent job on this score and so set future planar adventures down the right path. On the other hand, I'm not a huge fan of the module's many pages describing how differently spells and magic items operate in the Demonweb. This smacks of overkill to me. Don't misunderstand me: I see the logic behind it and I endorse it in principle. I simply found the specific implementation of it in Q1 to be more persnickety and detailed than suited me. Nothing slows down play than having to fumble through a module to see how a certain spell or item functions in the chaos of an Abyssal layer. Something along the lines of generalized guidelines would have served me better back in the day; goodness knows that's what I would do if I ran the module now. One of the most praiseworthy things about Queen of the Demonweb Pits is that it's open-ended, allowing the referee to use it however he wishes. The presumption is that the PCs intend to confront -- and slay -- Lolth on her home plane, but the module supports more than just that one approach. It could be used as a springboard for plane-hopping to other layers of the Abyss, alternate Prime Material Planes, and similar dimensional jaunts. That alone endears it to me. I also appreciate that, while the battles will be unforgiving, it is possible to destroy Lolth forever. I find that refreshing, even if I know that the likelihood of its ever happening to be slim. I rather strongly favor the possibility of slaying demons, devils, even gods, in D&D so long as doing so represents a genuine challenge to the players' skill. Why include stats for them at all if they can't be defeated? Q1 catches a lot more flak than it deserves, simply because it wasn't written by Gygax. Sutherland probably wasn't the greatest adventure designer, but he's far from the worst and, as I've shown, there's a lot to like here. I see it as a diamond in the rough rather than a jewel in the crown of the Golden Age. Sometimes, I prefer things a little rough around the edges; it gives me an excuse to roll up my sleeves and make it shine. Personally I ran Q1 for a party around 22nd level (1e) and they had a good challenging time of it, but killed Lolth in the end. I have no desire to run it again though, although I recently acquired the G & D series and look forward to running them. Does anyone know anything about Gary's envisioned ending to the sequence? I've heard something about the Sunless Sea, but not much else. Supposedly there have been a few fan-created D4/Q1 creations, but I've never been able to find them. Good recap. 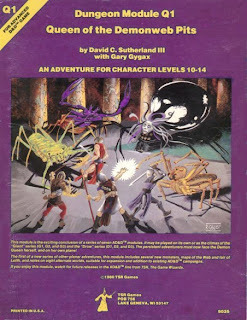 I did play Q1, have fond memories of it, and my PCs did kill Lolth (coming down to one particular d6 roll). The one thing that bothers me in retrospect is how the PCs would ever know about the intertwined levels in the first place. It seems like discovery of that is basically infeasible (I know I ran it wrong back ~1980). To the above poster, you can see of the Dragonsfoot 1E adventure page link, "Skein of the Death Mother" by John A. Turcotte, which replaces the final desert/ construct setting with a more conventional dungeon/ cavern complex. Spider form aside, there's no reason why Lolth has to take the spider motif to a gimmicky degree. At least not anymore than Demogorgon has to surround himself with killer baboons. I was always the GM for my group, and so never got to play in any of these "classic" modules. It's still a daydream of mine to actually play this series (Giants-Drow-Lolth) and the Slavers series. which is one of my favorites. I don't know, I've always found the thought of a spider filled layer of the Abyss to be an absolutely terrifying thought. But that could just be the aracnaphobia talking. Out of the entire module, I've always felt that the real gem of it was the portals to alternate Prime Material worlds. That, right there, was genius, and still inspires me tremendously. Especially the dwarves at war. Trampier did Titan? Huh. I should turn in my gun and badge. As for Q1's map, it's something like a MOMA from hell, innit? Agreed. That was my favorite portion, too; it had the feel of Moorcock's Million Spheres setting to it, at least for me. I get the impression that Planescape had much of its inspiration in this module. Interesting that one of the most well-regarded settings may have srpang from a scenario that was not so well-loved. One of the things that I found interesting about the module was that it truly did present the gods in a different light. Here's a god in her home plane and you can actually destroy her. What happens then? I always loved imagining what might happen in that vacuum. In my humble opinion gods should either be a nebulous ideal, or they should be very mortal. The middle ground just never sat well with me. This module presented one end of the spectrum that came to define my treatment of pantheons thereafter. I was a player in this module, and frankly I have to say that it was quite likely the pinnacle of my AD&D days back in high school. I'll always look upon this adventure with much fondness. I always got the impression that Planescape was largely inspired by the Manual of the Planes with a few unique elements thrown in here and there. But then again, it might be splitting hairs at this point. I experiened this with pretty much every module I ever had, especially those of TSR. Demonweb turned out to be an experience I had many times in my gaming life - a module that came nowhere near the hype. Something like this demanded to be well thought out, with encounters that friggin' made sense on a whole. It's a God's lair, for Chrissake! Lycanthropes are something that, to me, are supernatural things so tied to the material world (and plane)that their existance on a Godly place is just ridiculous. Undead also don't seem right except on the material world, or the plane of a death god. They could not come up with more original stuff for this far flung dimension than just the typical dungeon fare? A giant mechanical spider is the best they can come up with for this cosmic place? Sounds more like a modern Hollywood take on things. I think these guys should have read more 1970's Doctor Strange. Q1 remains my favorite module of all time. First, because it was the first module that took place on another plane and as a Teen DM (circa 1983) only armed with Deities & Demigods book - I had a lot of trouble figuring out how all these planes intersected wtih the Prime Material. Second, I loved the idea of a killer dungeon that then had gateways to "Other Worlds" a la Narnia. Also something about Lolth in a giant mechanical and yet magical spider was strangely seductive. I could not relate to the G-D series other than Vault of the Drow, which I took to be a large exercise in Machivellian politics. Of the players compromising their souls to defeat the Drow by aligning one House against another House. Church of Lolth against the Church of the Elder Elemental God. All the time whilst our poor female Elf Magic User was being slowly tortured to death. Re the Maps: I believe DCS was really a cartographer, rather than an artist, which is why the map is so cool. I ran this one a few days back in the day--like Weapon Speed factors and other bits of AD&D, I ignored most of the persnickety details. We always had a good time with this adventure and I used to look at p.27 and think cool, extra-planar thoughts. One idea that never, ever occurred to me is what happens to the Demonwebs after Lloth is slain. That now sounds like a more interesting adventure to me than killing her. When the PCs return to material plane do they find all spiders species snuffed out of existence? What are the ramifications? -->Is there a massive insect overpopulation? New insect monsters? -->Do spells or potions requiring spider parts or webs have drastic changes? Will they work the same? At all? -->What happens to Lloth's followers on the material plane? Do they seek another deity? Or become victims of another god? -->As stated before, what happens to the Demonwebs? Is it taken over by another god? Does it's ecology change without Lloth's life force? Was it something else before her and does it revert back? I suspect the optimal approach to adventure design would be a collaborative one between artist/mapmaker and writer -- more like the way that some of the great graphic novel & comic collaborations have been created, than like traditional adventure design. Does anyone know anything about Gary's envisioned ending to the sequence? I don't believe he had one, at least not one he was happy with. That's why Sutherland got the job to finish it, even though the end result was something Gary later claimed he didn't like all that much. Indeed. It's a pity how rarely this seems to happen, though. Aye -- unfortunately, in most cases, there's almost no communication between writer & artist at all. This, frankly, is a dire state of affairs -- leaving things in the hands of the editor or line director, to wrap up eventually, definitely leads to products that are of a lower standard than they need to be.